Do you remember it? I obviously went wild for it with its Chinoiserie theme (in a silhouette no less) and it's bold orange colorway...I was in love. But, I didn't get it because I'm sure it was oodles of money and not "practical" (I was naive). I can't get over the orange. And it has me seriously rethinking every bedroom in my house, but alas, I am resisting the urge - a huge exercise in self control. If you love this pattern as much as I do, some wonderful soul is selling the bedding set in Queen and King sizes on eBay. Do share if you bring it home so I can live vicariously through you! Oh my S&S...your bed sounds fantastic! I have it too! I have the coverlet folded at the end of the bed. 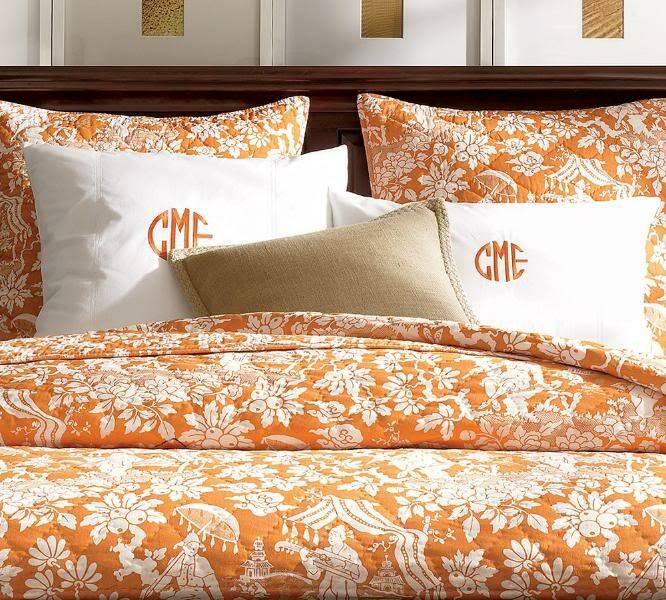 It is on top of a PB duvet that is pearl embroidered in orange. I am currently trying to figure out what color to paint the walls in the guestroom that it is in. Any suggestions? Yes CK! Palladian Blue by Benjamin Moore or Rainwashed by Sherwin Williams...and perhaps cut the color a little with white to make it lighter depending on the light that rooms gets. 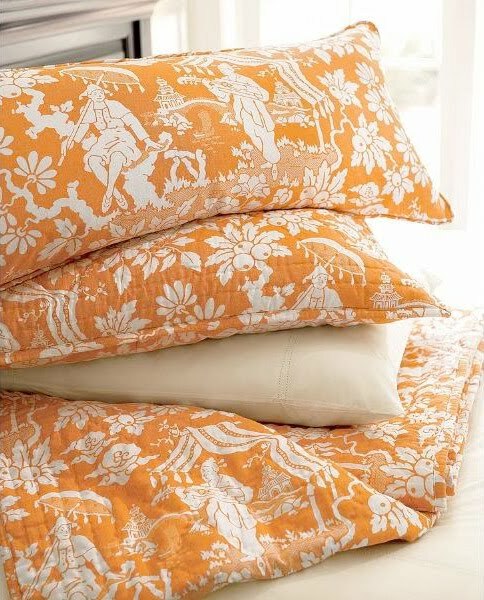 I LOVE orange with pale blue-greens...perfect for a bedroom. p.s. When I said "cut the color with white" - I meant have the paint store make it a little lighter...you probably caught that, but just in case it didn't make sense. LOVE it! I totally think YOU should buy this. I absolutely do not believe in coincidence and the fact that you stumbled upon it after all this time? It's mean to be! Hah...know what you mean about PB patterns. This is way too chic for them. Just like their brief foray into hollywood regency a few years ago. Orange I love it!! The bedding is just as cheerful and chic as your blog! I'm a little late to the conversation, but yes, I own the bedding set and happened upon it in a similar way to you. When it was debuted in the catalog I was not very in tune with my chinoiserie interest. However, a few months later I just "had to have it!" So I started googling and all that was left on PB's website was the pillow shams. I snatched them up and then waited a few more months (read: contemplating whether or not to proceed w/ bright orange bedding) before purchasing the quilt on ebay. I'm so glad I made the decision. The bedding set is my summer set. Pale blue walls and creamy white trim were in the room when we moved in, so nothing had to change. I added a fluffy white wool shag rug. Now I'm trying to decide on drapery fabric and fabric to recover a side chair. Any suggestions would be wonderfully appreciated! I'm not sure but the Queen might be Full/Queen. Now if only I could find the fabric!